BlueBerriest Design Baby Sling Discounts Apply ! BlueBerriest Pouch Slings is the creation of a baby-wearing mom of four. 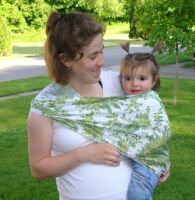 Made of a cotton/lycra fabric, the BlueBerriest Slings have a litle stretch making this sling comfortable for both mom and baby.